We have a stage area of sorts in the front of our room. It has a door and a window in it. Dee Dee saw that we could use that window to be the window in the wall of Jericho through which Rahab let the spies down. Here's how we did it. We always tell the Bible story first using power point, flash cards, flannel graph or stand up Bible characters. This gives the kids the picture. Acting it out helps to bring it to life. After she told the story, we had the children build up a wall of bricks in front of the window. This represented the wall of Jericho. Then we acted out the story. We had 2 spies, Rachel, and the bad guys who came to look for the spies. The spies knocked on the door of Rachel's "house" (you could build the wall in front of any classroom or use a refrigerator box). Rachel let them in and they basically repeated what she said to the spies in the Bible. Then, in a moment of inspiration, we grabbed the box of grass skirts from our resource room, and voila! We hid the spies under the flax just like Rachel had done. Once the "bad guys" were gone, Rachel let the spies down the scarlet cord out of the window. Lucky for us our "house" has a window in it. Then Rachel let the scarlet cord hang out the window until the next weeks lesson. 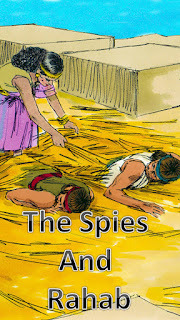 I enlarged the spies from a children's craft we found on-line. You can access the PDF here. I had to enlarge them quite a bit, so they are pixelated, but when you cut them out, they will look much better. I printed on 8 1/2 x 11 card-stock and then pieced and taped them together before cutting out. We used an old CEF flashcard story, but you can make your own flash cards or Power Point from the free images at Free Bible Images. Here's the link for the Rachel set.